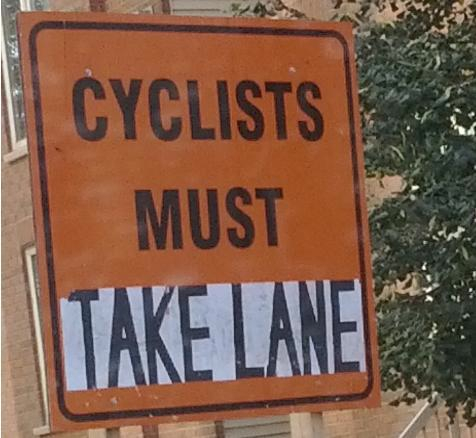 What: Altered construction sign that says: "Cyclists must take lane". Who: Lisa Nabieszko took this photo while sitting in traffic ... oh the irony!! Lisa is a Leslievillian with a new west-end day job, who used to commute by bike but has been driving in and out of Liberty Village. Construction crews are hurrying to finish projects before the winter freeze, and cyclists all over town are being told to get off their bikes and walk through construction zones. This sign (above) used to say “Cyclists must dismount”. Thank you to whoever altered it and replaced dismount with Take Lane!! Cyclists are legally allowed to take the lane. It is also advised by Can-Bike that cyclists should ride in a straight, predictable line, so it only makes sense if there is debris or, you know, 18 wheelers and scaffolding in the bike lane that you should be riding in the centre of the adjacent lane. Can-Bike says cyclists should be as visible as possible. This Can-Bike safety tip dictates that when one lane disappears you should use the other one. "Highway Traffic Acts across Canada tell all vehicle users to occupy any part of a lane when safety warrants it. Bikes are vehicles too. In the event of parked vehicles, construction, snow banks, etc. If the lane is obstructed and there is not enough room to share the lane while passing the obstruction, take the whole lane to prevent vehicles from passing too close." Big trucks with supplies are also parking in the bike lane on the south side at University during rush hour because they “have a permit” and a police officer, sipping Tim’s, on standby. It seems odd to me that in such a high traffic zone, with student cyclists and so many hospital staff heading into work should be expected to put up with such dangerous traffic situations without proper re-routes. Cyclists must take the lane. P.S. Be courteous to fellow cyclists and let them know when you are passing! Other cities love bike lanes. I totally love the sign alteration. I am sadly also a recent cyclist turned auto-commuter, as my job requires a vehicle most days. It’s nice to see the mention above of the Can Bike rules regarding “taking a lane”, in which most cyclists are unaware and drivers even less (even many police unfortunately). In fact, every point made above is extremely valid, but something is missing.. The rush hour commute is becoming insanely populated by cyclists (a very good thing I might add). They come in all sizes, fitness levels, abilities and unfortunately sense of awareness to their surroundings… Everyday I see a rider blindly swinging out to go around a construction zone or from the back of a pack of commuters to overtake other cyclists, completely oblivious to what may be coming from behind. This often results in near misses with vehicles and even other cyclists that are performing the same manoeuvre! It even culminates into several cyclists sprawling three, even four riders wide into traffic without a single shoulder check! !